Meditation is good for your bottom line. Here’s why. “It has been the single most important reason for my success,” says Ray Dalio, Founder of Bridgewater Associates, one of the largest hedge funds in the world. His “key” to success is something many would not expect. Doing nothing? Yes the billionaire says. Meditation has been a distinct driver of his great achievements. And there are countless success stories just like his, which is why meditation is quickly becoming an offering companies provide their employees. So they can stay competitive. And it makes sense. What do you think happens when you have a company full of people as focused, productive and driven as Ray Dalio? You make more money. In today’s day and age, lack of productivity and turnover are HUGE expenses for companies. Think about it. One minute, you’re compiling a report for your boss and then all of the sudden, you get a text from your friend asking about dinner. You answer, and then five minutes later you realize you’re still on your phone because an Instagram notification sucked you into your feed. It is becoming more and more apparent that technology and connectivity have been counterproductive in terms of our productivity. Meditation is a proven practice to help people improve focus, increase productivity, and stay on track in our world of distractions. Increased productivity = more output & efficiency = more revenue. The proof: Aetna reportedly saw employees gain 62 more minutes per week in productivity (an estimated $3,000/employees per year) after implementing meditation with their staff. Companies try so hard to create “great cultures” and happy work environments, but when you really think about it, a good culture is defined by one simple thing: relationships. A.k.a. do your employees enjoy working with each other? Meditation significantly increases an individual’s compassion. Good culture = less turnover = less expenses. The proof: A study by Northeastern University found that people who meditate were 50% more likely to help another person. It’s a pretty logical thought process. If employees meditate and are more aware of how they are feeling, they are more aware of their health and the choices they make, which is why people who meditate tend to improve/maintain their health. Healthier employees = lower health care costs. The proof: Back to the Aetna study, they found that implementing meditation decreased their healthcare claims by 7%, or $9 million. Work is hard and stressful. It always will be. However we make the choice of how we react to this stress. Meditation is a proven way to decrease reactivity, both towards emotions and situations. Less reactivity = less mistakes = less expenses. The proof: Alak Vasa, a former Trader at Goldman Sachs and Founder of Element Truffles, said, “There was this one instance where the market tanked and there was panic on the desk. The trading desk was an organized riot. Thanks to my meditation practice, I was able to keep my composure and propose solutions to reduce the impact of the market crash.” There have been studies that show meditation decreases anxiety, which allows people to be more in control of their emotions during intense situations. If you polled 100 mentors about some of the best life advice they’ve gotten on how to be a leader, I guarantee 99% of them would say “listen more, talk less.” An individual that meditates is less likely to be planning the next thing they’re going to say and more likely to be present, listening and absorbing what the person across from them is saying. This skill of active listening is huge in leadership. More effective leaders = more effective employees = stronger growth. The proof: Instead of throwing a bunch of data at you for this one, I simply want to pass along a real-life account of a business leader experiencing the benefits of meditation. So how do I implement meditation at my company? Shameless plug: If you live in the Detroit area, my company MeditationWorks makes it very easy/inexpensive for you to implement mindfulness meditation training in your workplace. 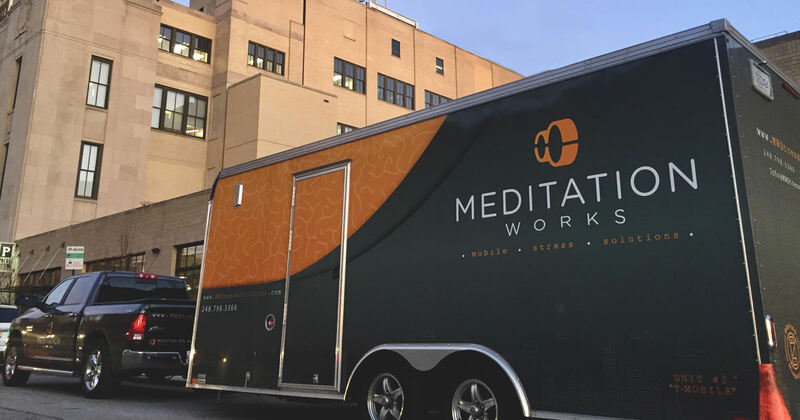 We have mobile meditation studios we drive up to your company to run quick, modern, 10-minute meditation sessions on a weekly basis with employees. We offer companies free first sessions and you can apply your company for one here. The bottom line is that pizza parties, pool tables, gym memberships, and kegs in the office rarely have an effect on an individual’s wellness. So to be straight forward, stop wasting your money and invest in a wellness effort that Ray Dalio would confidently tell you offers the best return on your investment: meditation. Try a FREE MeditationWorks session at your company!